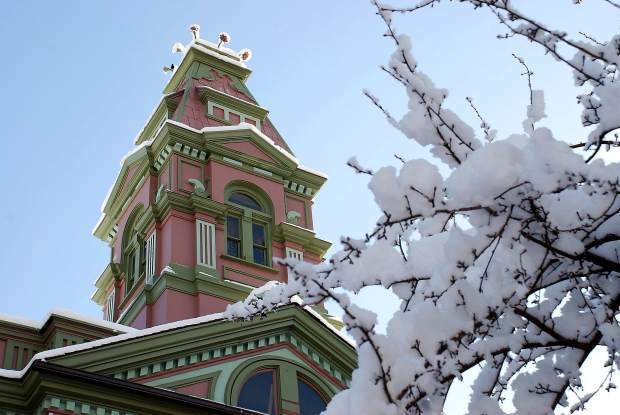 Fresh snow graced the Pitkin County Courthouse and the trees in front of the building Wednesday morning. The Aspen Water Department recorded 7 inches of snow on the ground for the first day of May, coming on the heels of the second snowiest April on record. May Day dawned white and wet in Aspen. Residents found a new layer of soggy snow on the ground Wednesday to start the month, coming on the heels of what wound up being the second snowiest April on record for the town. The Aspen Water Department, the official keeper of local precipitation data, recorded 7 inches of wet slop on the ground Wednesday morning; all of it fell in the wee hours of May 1. The midvalley saw snow as well, and about an inch fell in Glenwood Springs, but melted quickly. Light snow resumed falling in Aspen as the day progressed. For the month of April, Aspen’s water plant recorded 38.4 inches of snow, making it the second snowiest April since record keeping began in 1934. The snowiest April occurred just two years ago; Aspen saw 55.9 inches of snow in April 2011. The average for the month is 15.7 inches. Last month’s total precipitation — rain and the water content of snow — totaled 3.99 inches. That amount, too, was the second highest recorded at the plant during the month of April. The average for the month is 2.17 inches. The record keeping for total precipitation goes back to 1951; the record was set in 2011 with 6.3 inches. The snowy April was accompanied by some chilly temperatures in the middle of the month. A foot of snow was recorded the morning of April 18 for the prior 24-hour period; the high temperature for the period was 26 degrees. The low for the month, of 6 degrees, was recorded April 10. The final weekend of the month, though, offered gloriously warm, sunny weather and the daily highs reached into the 60s for the first time in April. The high for the month was Sunday, with a reading of 67 degrees. The overall snowpack for the Roaring Fork River basin stood at 93 percent of median Wednesday, according to the National Resources Conservation Service.